We do all types of IT repair. 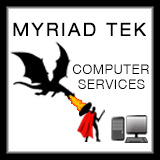 At Myriad Tek the customer comes first and we are always honest and dependable. Don’t take our word for it – check out our reviews on Facebook and Yelp! Myriad Tek is initiating a customer loyalty program. If you refer someone to Myriad Tek you will receive a 10 percent discount off your next visit. You will be able to refer up to 5 customers per month resulting in a 50 percent discount (on following visit). This program is only offered to current Myriad customers. Our back to school program was very popular last year and we have decided to offer it again for the upcoming semester, focusing on college students and their IT needs. This program entails becoming a college students personal IT tech, remoting in and solving problems on a timely basis (faster than a schools IT staff in most cases). Please give us a call to get more details on these programs . Celebrating 25+ Years of Referral Success! Website design, SEO, logos, eCommerce, and more!